Objective Increasing numbers of outbreaks caused by contaminated duodenoscopes used for Endoscopic Retrograde Cholangiopancreatography (ERCP) procedures have been reported, some with fatal outcomes. 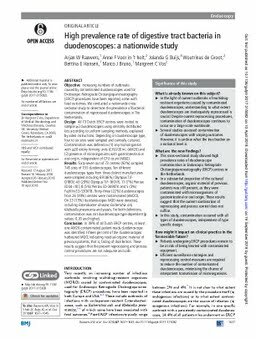 We conducted a nationwide cross-sectional study to determine the prevalence of bacterial contamination of reprocessed duodenoscopes in The Netherlands. Design All 73 Dutch ERCP centres were invited to sample ≥2 duodenoscopes using centrally distributed kits according to uniform sampling methods, explained by video instructions. Depending on duodenoscope type, four to six sites were sampled and centrally cultured. Contamination was defined as (1) any microorganism with ≥20 colony forming units (CFU)/20 mL (AM20) and (2) presence of microorganisms with gastrointestinal or oral origin, independent of CFU count (MGO). Results Sixty-seven out of 73 centres (92%) sampled 745 sites of 155 duodenoscopes. Ten different duodenoscope types from three distinct manufacturers were sampled including 69 (46%) Olympus TJF-Q180V, 43 (29%) Olympus TJF-160VR, 11 (7%) Pentax ED34-i10T, 8 (5%) Pentax ED-3490TK and 5 (3%) Fujifilm ED-530XT8. Thirty-three (22%) duodenoscopes from 26 (39%) centres were contaminated (AM20). On 23 (15%) duodenoscopes MGO were detected, including Enterobacter cloacae, Escherichia coli, Klebsiella pneumonia and yeasts. For both definitions, contamination was not duodenoscope type dependent (p values: 0.20 and higher). Conclusion In 39% of all Dutch ERCP centres, at least one AM20-contaminated patient-ready duodenoscope was identified. Fifteen per cent of the duodenoscopes harboured MGO, indicating residual organic material of previous patients, that is, failing of disinfection. These results suggest that the present reprocessing and process control procedures are not adequate and safe.